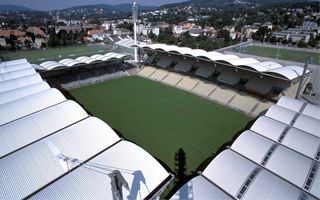 May 4 is the last home game for Rapid and the game against Wacker Innsbruck is also considered a farewell to Gerhard-Hanappi-Stadion. The club hope construction of the new one will begin during the summer break in the very same location, forcing relocation of next season’s games. According to several Austrian websites it’s not yet clear the reconstruction will begin before next season starts, so theoretically the club may spend first weeks of the upcoming campaign at their current home. But on Friday Rapid’s president Michael Krammer announced progress in shortlisting the contractor. Of four companies interested two remain in the race, while finances are being secured for the new project. It’s also understood the new arena will have a naming rights partner, but no official name surfaced so far. What is clear, is that the new stadium will be rotated by 90 degrees, so that both side stands are west and east of the field instead of south/north layout. This in turn forces most vibrant fans to move south, because they now occupy the west end, where new corporate zones will be. The new ground will increase capacity to 24,000 with potential to grow further.